Every year we pick a new cuisine for TY Day, and this year it's Moroccan/North African. 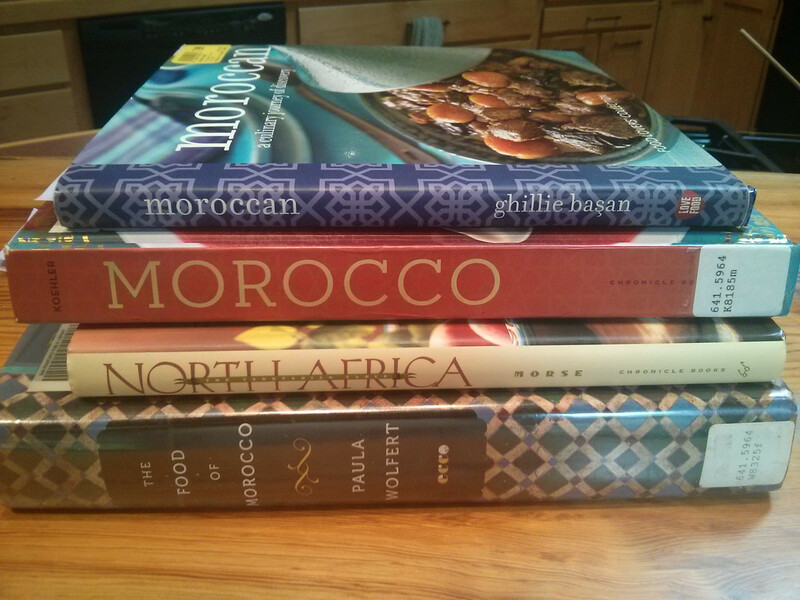 Since I don't have lots of experience with Moroccan food, that means time to hit the cookbooks! I used two I owned already and two I borrowed from the SFPL. Moroccan by Ghillie Basan: this is a general Moroccan cookbook, with a general assortment of recipes from the standards of Moroccan food, so a few appetizers, a couple of kind of couscous, and a half-dozen tagine. The recipes are well-written and easy to follow, though, and the couple of things I've prepared from here have been good. For TY Day, I made the "carrot salad with feta" out of here, which is really more of a roasted carrot hummus. Recommended for anyone who is looking for a slim general Moroccan cookbook. Morocco by Jeff Koehler: a much more substantial general Moroccan cookbook, with a good representation of all kinds of foods, especially tagine and side dishes. Has a moderate number of seafood dishes as well, something Ghillie Basan lacks. Spectacular photography by the author, including photos of most of the dishes, which are really helpful if you've never made them before. In comparison to Wolfert, though, Koehler's instuctions can be somewhat vague ("coin-sized pieces"). Recommended as an all-around Moroccan cookbook. The Vegetarian Table: North Africa by Kitty Morse: despite her name, Ms. Morse is a serious North African cook, having lived in Morocco for several years. This slim cookbook gives vegetarian dishes and remakes of dishes from Morocco, Tunisia and Algeria. If you're a vegetarian, this is the Moroccan cookbook for you; otherwise, you might choose one of the others. Since Morse seems to be very fond of pastries, I'm making the Fatima's Fingers from her cookbook. The Food of Morocco by Paula Wolfert: her first cookbook was Moroccan food, and Wolfert finally returns there with this omnibus. If you want one massive cookbook which covers almost all of Moroccan food for you — including very detailed instructions for tagine and couscous — and don't care how much bookshelf space it takes, this is it. Also has extensive chapters on breads and seafood, something most Moroccan cookbooks lack. I'm making "tagine bread" and "fish tagine with creamy onion charmoula" from this cookbook. So, four cookbooks, all recommended depending on what you're looking for.